Hi! Welcome to From His Presence! 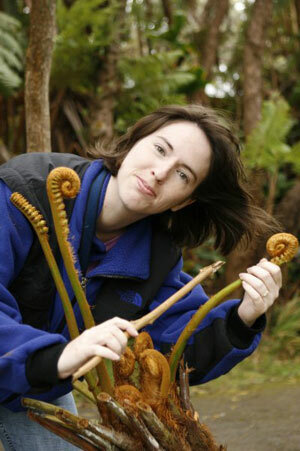 Yes, I’m playing violin on a Hawaiian tree fern in this photo, but that’s another story! I’m Jamie Rohrbaugh. I equip people to walk in power, find healing on the inside, and fulfill their destiny … and I’m very pleased to meet you. Could you use some encouragement? If so, you’ve come to the right place. I post prophetic and encouraging words on this blog multiple times per week–generally on Monday, Wednesday, and Friday, with additional words scattered here and there. Sign up for free email updates so you don’t miss anything! You’ll also find loads of additional, free materials in the article series listed at the very bottom of this page! Want to become more powerful for God? Look for all the equipping in our free webinars, as well as on our Facebook videos and YouTube channel! I’m an author, a speaker, and a Presence seeker. A daughter of God, and not an orphan. I was born for revival: to see the fullness of the Third Great Awakening come in my generation. I write and speak to encourage you. I want to equip you to walk in the radical power and love of Jesus. What will you find here that will change your life? Simple: You’ll find posts, webinars, and other materials that will help you make “on earth as it is in Heaven” reality in your life. I have a very active sense of humor. Life, in general, is a pretty good time for me. I really enjoy eating, especially Mexican food. I’m married to Bruce, the best husband in the world. 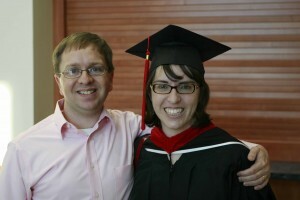 The picture of Bruce and I at the right is from when I graduated from seminary in 2012. The man should always wear pink. I love to read, especially books by the dead guys. Finney, Tozer, Spurgeon, John Wesley, and Jonathan Edwards are my heroes. I wanted a golden retriever, but my husband said no. So I got a really needy Siamese cat named Moses instead. Moses bites me and most other folks too, but I adore him anyway. I love crafts and working with my hands. I’m a pioneer. Need something started? I’m the one to help. However, when needed, I can cook a couple of things decently. Cheese lasagna is my specialty. Four pounds of cheese, two jars of sauce, pre-cooked pasta, and some Mrs. Dash seasoning. You can’t go wrong. I also ran one 5K, which I won, but only because God made all the other women in my division stay home. I’ve been through hell and back in my life. Several times. Jesus is the one that has always brought me back, even before I knew Him. I had a personal, life-changing encounter with Jesus Christ for the first time when I was 21. It happened because God gave me a black 1981 Corvette. I figured if He wanted me to have a Corvette, He must love me after all. It was the first time in my life that I felt the love of God. I drove that same Corvette to Pensacola, Florida, in March 2003, where I had a radical encounter with the Holy Spirit at a Joyce Meyer conference. My life has never been the same since then. But I did retain my affinity for Mexican food. I love to travel. LOVE. 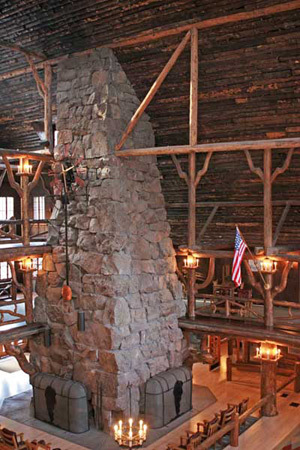 My happy place is the Old Faithful Inn in Yellowstone National Park. I put a photo of how amazing it is on the right. Even the photo doesn’t do it justice. I play viola. I try to be in tune. I am wasted for the Body of Christ. I love seeing how every person fits together in life and ministry. We need one another. I live grace-conscious, not sin-conscious. God keeps me on a short leash. If I sin, He convicts me and I repent right away. Other than that, I never think about sinning. I just live in the presence of God. I think just focusing on God all the time is the best kind of spiritual warfare. God blows me away. I’m wasted for Him. I’m also wasted for the Word of God, the Bible. I’m called to the study and ministry of the Word. My husband is a geologist and a talented nature photographer. I worked almost 15 years in a corporate job with a Fortune 500 before I went into full-time, vocational ministry. I chew on Bible passages slowly. I aim for quality, not quantity. I would like to memorize whole books of the Bible someday. I saw a young guy recite Philippians awhile back, and it blew me away. I have about 58 favorite songs. That’s a lot of information, but hey, you’ll find a lot of openness on this blog. We all go through the same types of things; it’s just that not all of us talk about them. I’m called to talk about them, and I hope my learnings and even failures can help you. Are you ready to get fired up about Jesus? If so, great! Please check out all the great pages on the site, follow my posts by email, Facebook, Pinterest, or Twitter, and let’s have a great time together!